Materials -	stainless steel, cast glass, height 5m. A group of stainless steel and cast glass Spanner forms installed in the public open space of Showell Park Housing Development. 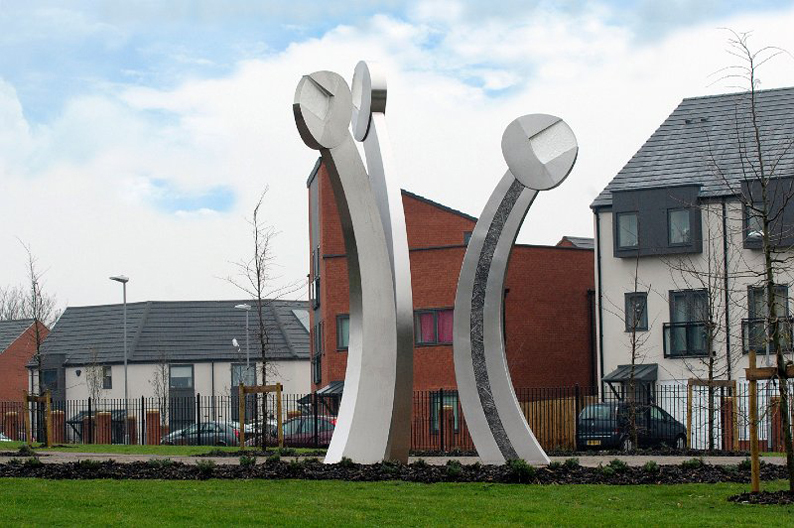 It was previously the site of the Britool factory, where many local people used to work - these Spanner sculptures also reflect the current use of the site as a park with their morphing plant-like forms. There was extensive community consultation over the subjects that we based the designs on. The Spanners were fabricated by Castle Fine Art Foundry and they also arranged the casting of the stainless steel relief strips running down the centre of two of the sculptures. Jackson Fawkes cast the glass inserts, made for the jaws of each Spanner.